If you are looking for an unusual fund raising idea then a racenight or race nights could be just the thing for you! Here at Race-night.com we offer the very best UK flat and jump horse races along with our unique pig racing events. You can have all the fun of a night at the races and not leave your club house! if you live in an unusual location or need access to a race night urgently, you can get this from us. We have exactly what you need for your race night. No matter what your objectives are we can help. A race night is just like going to the race track but you can do it on your own premises. 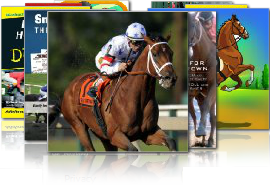 What we provide is a selection of high quality horse and pig races. Each of the races has 8 runners which means that you can pick both horse and pig races in your packages and can mix and match these different types of events. So let me walk you through what actually happens at night at the races. The first thing you will need to do is download the package that you require. We have a complete selection of a number of races so you can run an event with as little as two races or actually as many as you would like. Most people run 8 race events as this will last approximately 3-3.5 hours. This depends upon the number of clients at your event and how quickly you can process the tote. The tote is where people place their bets on the races. Customers pick their horses by number or by the name on the race card. Full instructions on running a race night. We also provide free fund raising books to help with your overall fund raising. You will need to organise your hall or location for the fund raising event. You will require a computer and projector so you can show the races. You will also need some form of sound amplification and PA system so that your compare or MC can speak to the audience easily and everyone can hear the races running. People do get excited and start shouting and screaming during these events!! At the start of your event you will show the introduction film which sets the mood for your clients and lets them know how the evening runs. Your clients will then select a runner from the race card, either by the name they like or by number. All of the races we provide are called by number. This is good news as a fundraiser, as this allows you to name the horses anything you like in the race card which is a great fundraising opportunity. You can sell each of these horses in the race card to a sponsor and raise those much needed additional funds. Once the client has selected the horse they like, they come to the tote where they purchase a ticket for that particular horse. We recommend you set the value of each ticket as either £1 or $1 to make your calculations nice and easy. This will allow you to quickly take all of the bets prior to the race being run. Once all of the bets are in, you then close the tote and run the race. When the race is over, everybody will know who the winner is and the owner of the winning tickets will come to the tote to collect their prize money. To help with this, we have an Easy Tote Calculator which is a free download on the website and this will work out all the odds and payouts for you. We also offer a Tote Calculator download which is a simple sheet of paper which allows you to calculate your payouts. Full instructions are included. You now need to just repeat this process for all of the races at your event. Our instructions have been done from over 30 years of experience and answer every question which has ever been asked. Many customers using our service have done so for the first time and found the systems very easy to use. If you require any further help or assistance for your event please do not hesitate to get in touch. Please see the ‘contact us’ page.